Giardia–what my microbiologist daughter calls it. A possibility–what the doctor called it today (“Have you been up in the mountains?” Yes) as she wrote out the lab order. 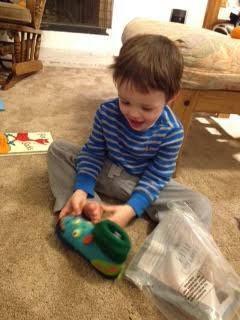 Parker exploring Grampa’s spinner toy over the weekend. A fellow enthusiast! Today was our last day with the happy couple, the other faraway kids having already flown home. Alright, so, one little boy’s favorite rock needs to go in the mail back to him, stat. Are there any small boxes we didn’t recycle already? And that long-de-glued niddy noddy that I always had to put the one piece back on the top and that was always a pain for the first few yards of winding hanks of yarn on because it wanted to flip off–thankfully, the little boys discovered the thing and that piece is nowhere to be seen and gosh darn, I’ll just have to buy a new one! So sad. Not. There was another great joy that took place this weekend that I haven’t mentioned till now. There were airplanes today, lost luggage, and now we just have the last two for a few more days. Michelle drove John to the airport for us while the four of us took off after lunch for the coast. He (I forgot to ask permission to say his name) had never seen the redwoods before. We hiked through Memorial Park a bit through the towering ancient trees, having the place nearly to ourselves in the cold. They went a little ahead down to the creek, where he splashed his hand in California water and pulled the one piece of manmade this-does-not-belong-here out to let the water be freed of it. We followed the signs along the trail in search of the park’s tallest redwood: there, up ahead, thirty-nine feet around, 225 feet tall and 1600 years old, solid and sturdy and lasting through storms and lightnings and fires, steady through every blessing and every stress of life. It seemed the perfect place to take a newly-engaged couple’s photo. There was a name on the bench with a fresh soft yellow rose by it. Should that family ever see this photo, please know that we bowed our heads a moment at your loss and moved the rose back to its rightful place at that center spot afterwards. It bore silent testimony that love is simply who we are and what we have. From there we took him to see the ocean as we get to see it, warning him that no, it’s not warm, not at all. Again, he touched it and made it a part of himself too now. He is so good to our daughter and they are so happy and we are so happy. We get to have him in our family! So. Much. Joy. Yesterday, Parker wanted to go out to see his apple tree. His daddy explained that we have winter up here and what that meant but he wanted to see, and being ever ready to share the joy of my backyard orchard, especially with a grandchild, I went outside with him to inspect how the Fuji was doing. It did still have a very few leaves left clinging. The other deciduous trees were bare now but one. So we talked about all the fruits and each in their season and all that was fine with him for it to be that way, he wasn’t disappointed like his father had been a little afraid he would be–he was simply learning new things. Winter bare, not from a book but in person. The leaves fall. Spring will come back when it’s time. There was actually some fruit and greenery over to the left but he knew what those were and they didn’t interest him. The Meyer happily had a few right in his reach. I mentioned it had thorns and to watch out for them and he was fine. He walked around the back of a peach (the Tropic Snow) to get to–oh wait, he liked that one next to it even better. It only just now hits me that I had said a lemon, so a single lemon was all he expected or took. Unlike sharing apple slices around the room, this was just going to be between him and me. It took some pulling and a bit of branch coming with it because the lemon tree wasn’t entirely ready to let it go yet–but this early, they’re closer to pure lemons and less orangey. He skipped a little happy dance all the way back inside to the kitchen in great anticipation. I found a cup-size strainer and showed him, bringing it down to his eye level again and again, how it caught the seeds and let the juice run through. See? More seeds on this other half of the fruit, too. I added some water and sugar. Don’t skimp. He’s only just turned five. I poured half the lemonade into a second cup for me, tasted it, and added more sugar to his cup. Mine was sweet enough and very watered down and his definitely sweet and with great enthusiasm he pronounced it wonderful. Meantime, Hudson was the ever-cheerful, outgoing little boy he always is even when he’s tired. Always ready to laugh. Always willing to wait his turn when I pay attention to his sister a moment. He’s an amazing little two-year-old. As I sat on the floor, Maddy crawled up to me, patted me on the leg to get my attention, and held out a hand expectantly in clear expectation that I would blow on it. I did. She grinned. A few minutes later she stood up with her mommy holding onto her hands, let Kim let go, and instead of plopping right back down to safety or the highly tentative shifting of her weight onto the next foot forward she actually took two solid steps on her own coming towards me, falling down finally on the third. So close. And given the sudden wail of frustration out of her that took us by surprise, I think she suddenly realized that she actually wanted to walk. That this was going to happen even if it meant giving up the comfort and safety and speed of the crawl. She needed this. Soon, little one, so very soon. Our friends’ range that was supposed to have been replaced was still broken, no oven, no stove, with the new one lost in the shipping mess out there somewhere. We cooked dinner here and brought it there and shared our kids (theirs had grown up with ours) and a marvelous Christmas meal together. I wouldn’t have missed that for anything. Then off to our aunt’s house in the redwoods for dessert and so that that part of the family could see the kids–with our grandkids and their parents showing up there straight from the airport. Maddy was sick but I got a grin out of her: I blew noisily on her hand or her foot in term, asking her which one she wanted next. She would say what to her was a word and hold one or the other out and she loved that she was communicating with me and getting to choose what I would do while she happily anticipated it. Bbbtttph! Thought I’d gotten that concept down with him previously but I guess not. We made up for it though. And Parker was already taller than when we saw him almost two months ago. She has a baby brother and that was suddenly a question she decided not to answer and she twirled away and played with someone else as I grinned. Wishing a Merry and blessed Christmas day and holiday to all. No matter how ready you think you are, when house guests are coming you keep seeing one more thing that needs to be done. Oh yeah and that too. And that. And endlessly that. In the middle of the madness we decided to do what we had decided not to, yesterday–going near Costco? Were we crazy? Then when we were just getting back to the car to load it up I suddenly knew exactly why we had needed to come, and not last night but now: she was just arriving and had parked a car or two further down from ours on the same side, same aisle. The choreography of G_d, right there. About a year and a half ago? After three years of abnormal blood tests, I got sent to the hematologist and that means in the cancer department. Saw him twice, didn’t have to have a bone marrow biopsy after all to rule cancer out (phew!) and I got off lucky. But as I was coming out from what would be my last appointment with him, there she was in the waiting room. We both did double takes–my hair was gray and a little longer now, and she was the last person I would have expected or wanted to see in that particular space–and then she had me sit down (gladly!) next to her and we caught up until they called her name. And when they did, I said to the nurse, “She was my kids’ favorite teacher!” Which is true. They adored her. Two of my kids scored seventh and eighth in French proficiency in all of northern California and she is the reason why. She totally rocks. She had already gotten her results when I saw her. Her tests hadn’t come out as well as mine. I was so glad I got a chance to bring some joy to her day in that place at that time by bearing witness to who she is. She has quietly been in my prayers every single day since. She saw me first today, waved hi as I blinked in surprise and ohmygoodness! and we threw our arms around each other. She was still here!!! She looked great!!! And shopping! At Costco! The day before Christmas Eve! Brave woman. It takes a certain level of health, too. Having some experience at being a patient myself those were not the things that actually came out of my mouth, just, How ARE you?! Our kids and hers are all coming home for Christmas and she was so happy for us that we got to have that joy too! And it wasn’t till after we left that I realized that with my hearing and the freeway running close by I wasn’t totally sure whether she meant last January or the coming one. But I can tell you this: she’s clearly ready for anything now. The Cooper’s hawk sauntered away, if anything elegantly airborne can be so described, and I went oh oops sorry didn’t see you behind the orange tree there as I went back inside. No problem. He people-watched awhile, shaking off a bit against the drizzle, preening. Then he flew half way across my yard to where the sun could be on rather than behind him, showing off every bit of chestnut, white, grays, and those bright yellow feet, well-fluffed above as if there had been no rain. Here inside, more presents are wrapped and ready, the guest bedrooms are cleared and vacuumed, and the–oh wait, the electric spinning wheel is still in baby-grab range. Right on it. Perched on the telephone line in the center of an open space between the neighbors’ trees, where it could best be seen, was a Cooper’s hawk this afternoon, celebrating solstice by surveying all that was his. I saw his tail twitch slightly as he shifted his weight. All tucked together like that it did not give away what it could be in the air. I watched him awhile, loving this beautiful raptor that let me share the day with him, making sure to blink and turn aside a bit from time to time so I didn’t present in any way as a threat. And once again I wondered if it could feel a human loving him–and I know how anyone with a pet would answer that, except that who can answer for a wild thing? At that he raised his wings and flew towards me, landing on the closest point in the fence where we had a better view of each other. Was it my old friend Coopernicus or one of his offspring? I’m not quite sure yet. But clearly, my yard is his in the season to come and I am better off for it. You’ve probably heard the story before but it’s one I’d forgotten: the typo in the 1955 Sears ad that had small children thinking they were calling Santa when what they were getting was the red hotline phone at the Continental Air Defense Command at the height of the Cold War. That phone was not expected to ring. You did not want that phone to ring. The tension and surprise showed in the officer’s voice and the little one started crying. The colonel stopped himself and reached out like the daddy that he was. And that is why (there’s an interview with the colonel’s kids in this link) we have NORAD tracking Santa every Christmas Eve, giving updates as the famous sleigh and reindeer travel around the world. For the magic of it. I wonder if the person who typed up that ad ever knew what they inadvertently made happen for every child of every year since. I like to think that surely they did. Some mistakes are just plain meant to be. Oh, so that’s what happened. I was reading someone’s complaint that the Democratic candidates’ debate that was supposed to start at 5 pm Eastern didn’t at all because the pundits spent the first half hour guessing what was going to be said, making everybody wait on them. And yeah, I might have been annoyed had I set aside the time to watch it–which I would have, had we been home. But that delay is why we got to see the last half hour of it after we got back from a friend’s Christmas party. When it was over, I tried to see if anyone had the full video available yet. Nope–only Clinton’s, and only Clinton’s, opening statement. Curious. Eh, wait a day or two. And now there are highlights posted. I don’t want highlights and pundits: I want to see all of what the candidates said, how they said it, and how they responded to each other so that nobody’s making my decision but me. I wrote a long post. I deleted it. I’ll just let this guy say most of it. Note that the contract the Democratic National Committee had had Sanders’ campaign sign when they rented out the voter data to them put no requirements on what they could or could not do with what they found there–it was a badly written contract, but it meant that even the staffer Sanders immediately fired for downloading Clinton’s information had done nothing wrong per what they had agreed to. But the DNC sure did. They ignored the Sanders campaign’s repeated pleas to close their security breach. They had stated in their contract that ten days’ notice would be given before cutting off data to a campaign and they did no such thing. Bernie Sanders landed major endorsements and got his two millionth donation and had a very very good day and suddenly they cut him off from his own data and donors. Whatever you may think of any of the candidates, that’s wrong and blatantly anti-democratic. Here’s one petition that got over a quarter million signatures in one day. Go git’em. It took picking up my fifth cookie (good thing we rolled them thin, good thing they’re not too big, good thing breakfast was a good excuse) for me to see it. Richard wasn’t raised a musician but I sure was. I sent a note off to Tatiana, the woman who had made my rolling pin, with no intent but that she should know, and she had the same surprised reaction–and wrote back quickly that she had caught that effect on other designs and had changed them as needed but had somehow missed it on that one. She would be sending me a new pin straightaway. I wasn’t expecting that at all! But I’m in happy anticipation all over again, made all the sweeter by gratitude, that I’m going to get a new, really cool rolling pin that this time I can say I know we can and will use a lot. I found myself flashing back to Mr. Kitto’s fifth grade classroom when he stood at the front making arm motions that we were supposed to copy for reasons I have no memory of, just the fact that his right side corresponded visually to my left side and I kept wanting to turn around in my seat to face the same way he was facing so that I could be completely sure I was echoing him correctly. I was in fifth grade, fer cryin’ out loud, I was supposed to get this by now! But looking at each other, we were opposites to each other and part of my brain knew and part of it refused to. So close. It’s still a really cool cookie. I wonder how many people would notice? Would they guffaw? Would they be afraid they might cause disappointment if they called attention to it? Would I lay such burdens on my friends? If the cookies tasted good? (If it’s for Jim and his family? Don’t miss that story if you haven’t seen it yet. Can you believe that kid is a senior now?!) Heck yeah! (Gleefully conspiring.) We could have fun with this before we retire the oops version. What I really wanted was beautiful musical cookies to offer the piano tuner, who came today, but the whole thing was just too new and uncertain. I needed a little more proof of concept first. 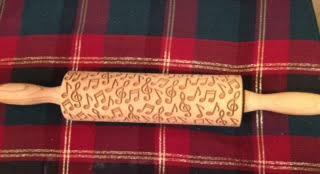 But I did show off the rolling pin itself and he thought it was as cool as I did. So after that bit of procrastination, here’s how it went this evening. The cold dough was very hard, so Richard rolled it out for me between two sheets of parchment paper. A shout-out here to Joanne, whose wax-paper-layers tip was exactly the memory of my mother’s pie baking I’d been trying to think of. Parchment works even better. We quickly found we needed just the slightest sifting of flour onto the pin, not any more than that, and so I got out the small citrus-seed strainer (or at least that’s what that thing has always been to me.) Shake a little on, shake the excess off, roll the flattened dough with the embossed pin. Lift the cut cookies out with a very flat spatula, re-roll out the rest while those are baking, repeat. And here you have your before baking and after. I had a toothbrush still new in the package and it was perfect for getting any small bits out afterwards. There were surprisingly few to have to worry about, but still, it was a highly useful tool. Richard’s first try was a flat-edged toothpick and it was too bulky in the tight spots. The star cookie cutter cut off too much of the musical patterns. You know what this means. I ended up searching Williams-Sonoma, Amazon, Wilton, Ateco (new to me) and Sur La Table looking for cookie cutters in the shapes of the ones the rolling pin vendor used, hoping I can find who makes some and who sells them in easy driving distance. What, order? And have to wait to make more? So in between wrestling the ladder inside, setting up the overhead greenery-with-bells, cleaning the rug, wrestling the tree and ornament boxes back into the garage, getting the guest bathroom toilet to work that we’d simply turned the water off to to stop its leaking (yeah we paid that plumber $150. It lasted two days) and various laundry and cleaning, finally, this got done, too. I used the Russian rolling pin vendor’s second of two recipes (because there’s still no cream cheese here), weighing my sugar, flour and butter on what I think of as my yarn scale to get the right amounts. Into the fridge. Tomorrow we roll with it.